Let’s talk URF, the recipe for poro snax, and shooting poros with lasers. Why do we keep getting different versions of URF mode instead of regular URF? URF makes some people stop playing League. Every time we ran regular URF, we’d see a huge spike of games being played, and then the numbers actually dropped back down to a level that’s lower than it was just before we ran URF. It’s normal for new players to join League and for some longtime players to leave—this happens all the time. But when we turned on regular URF, it was different. In NA, for example, whenever we ran URF we’d usually see over twice as many longtime players leave the game compared to what we would’ve normally expected. In other words, some people binged on URF, and then suddenly stopped playing League. And the size of the dropoff indicates that it’s not just people coming back for URF and then leaving afterwards. 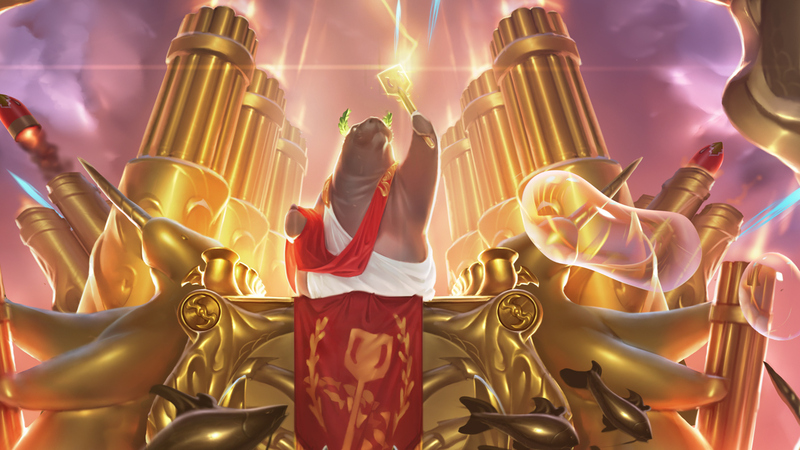 Despite spending a lot of time investigating the reasons, we aren’t actually sure whether URF causes some sort of “hangover” effect or if it makes regular games feel slow by comparison—maybe it’s because URF feels like playing League with cheats turned on. Regardless, after we turn on URF, total games played go down, as do overall game hours. And they don’t recover for a long time, if ever. We’ve been trying to wrap our heads around a way to solve this problem for a while, and that’s one of the biggest reasons you see us experimenting with variations on the mode like ARURF and Snow Battle ARURF. Although these modes still suffer a bit from the “binge-then-churn” effect that regular URF has, it’s not nearly as bad (probably because you’re not seeing the same OP champs every game). URF causes some people to stop playing League, but a lot of you really love it. So instead of killing URF altogether, we’re just gonna keep experimenting to find some healthier version of the mode. Tell us your thoughts about Snow Battle ARURF—we’ll listen and apply what we learn to ARURF’s next appearance. What’s the recipe for the poro cookie? This savory blend of free-range, grass-fed Avarosan game hens and organic, non-ZMO Freljordian herbs contains the essential nutrients necessary to keep your poro purring with pleasure. Poro’s prefer their snax warm, so if you have the Living Forge handy, even better. WARNING: Bring a handful, because feeding one poro will lead to a whole fluft of them gathering at your feet.